F&M Trust is proud to have their very own Fulton County Barn Quilt. We are a local, independent community bank that strives to serve the communities, businesses and individuals of our Fulton market. Our focus is on developing relationships that build trust, growth and strength for the individuals, businesses, and organizations of each community. Our goal is to be a significant part of each community we serve. The Barn Quilt trail serves as an important part of our agricultural heritage and reflects our history in many different ways. We chose the Pennsylvania Keystone Quilt pattern to reflect our deep seeded roots in the communities and counties we serve in Pennsylvania. 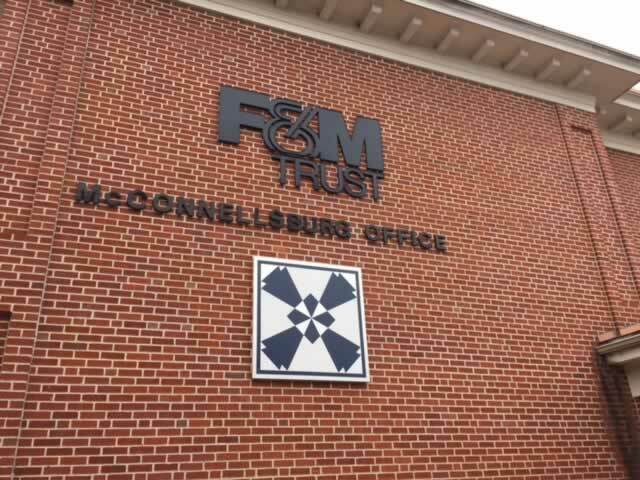 The colors we chose represents the corporate identity of F&M Trust, which is prominently displayed at each of our twenty-two office locations.